← Sir Walter Miler – Friday August 1st! North Raleigh Gets A Cheese Shop! I made a quick visit to Lafayette Village last night to check on the progress of Six Forks Cheese. This is a new cheese shop opening up in North Raleigh that will offer a host of fresh gourmet cheeses with a focus on American and European cheese and a special selection of local small-batch and NC farmstead cheeses (Chapel Hill Creamery, Goat Lady Dairy, Looking Glass, Spinning Spider, Cultured Cow and more). The shop will also feature a full line of unique meats, relishes, accoutrements and charcuterie. When I stopped by I was happy to see a sign on the door announcing they plan to open this Friday July 18th! I’m looking forward to checking out this locally owned and operated cheese shop and plan to return once they open and share additional pictures. In the meantime check out their facebook page here. 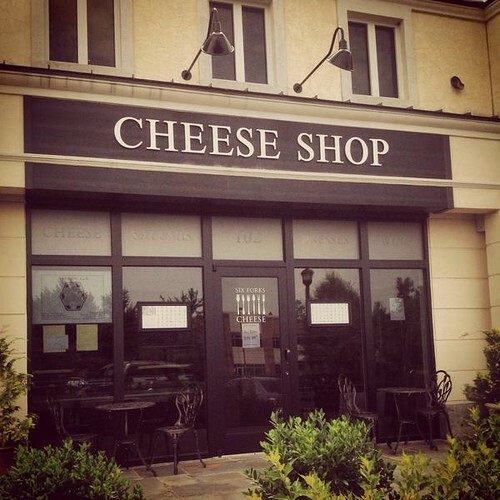 We are so excited about Jacey & Matt’s new cheese shop, and that we have them as our new neighbors in Lafayette VIllage.